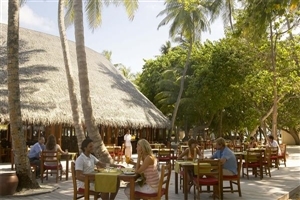 A chilled out, premium resort that offers you the true magic of the Maldives, Meeru Island is a wonderful all-inclusive hotel. 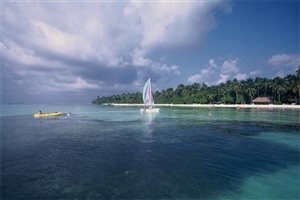 The Indian Ocean glimmers beautifully around the pristine island as you ease your way into a holiday of pure relaxation. Get an authentic experience in secluded paradise as you take an hour-long boat ride from the capital to the soft sands of the Male Atoll. 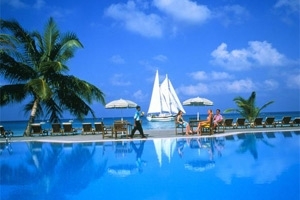 The island is called Meerufenfushi, and this is the only resort to be found on the small haven. 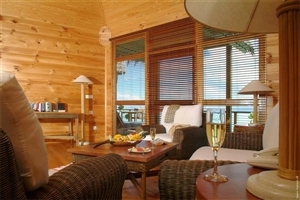 The land accommodation, which is a mix of beach and garden villas, is set amongst the tropical foliage that dominates the middle of the island, and the resort blends into the palm trees. White sandy beaches wrap around the perimeter and the sparkling warm water laps the shore –with premium water villas for you to enjoy. 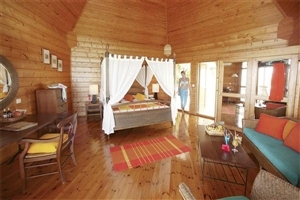 These all come with great privacy, some with sundecks, and the vibrant island also has activities to enjoy. There is a snorkeling trail and scuba diving to see the abundant marine life as well as a number of water sports and excursions. Bck on land there get numerous sports facilities, including a golf course, while there is live entertainment each evening. 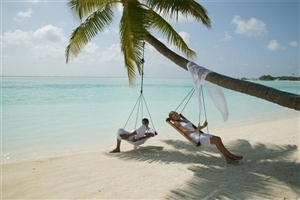 As the only resort on the beautiful Meeru Island, you are welcomed to the Maldives with a palm tree-filled interior, wonderful white, sandy beaches and a luscious lagoon. 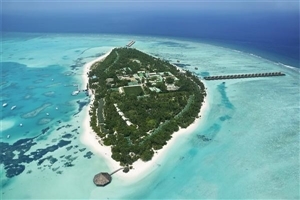 Beach villas, garden rooms and water villas are scattered across the 1200 metre long by 350 metre wide island. 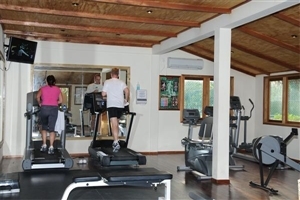 Friendly hospitality comes as standard and there are a number of activities to choose from – or you can simply relax. 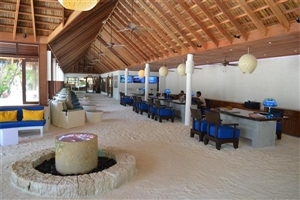 There are buffet and a la carte restaurants and bars for wining and dining while the activities range from snorkeling and water sports to golf, gymnasium and a spa. 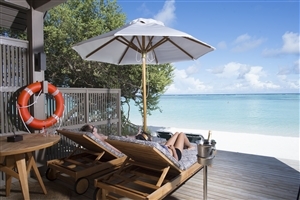 Whether you are celebrating on a romantic escape or want a beach holiday for all the family, the Meeru Island Resort offers everything you could want. A vibrant island with private accommodation, you are on a secluded paradise with plenty of wildlife and marine life to explore as well as plenty of sun to bask under. Here, nature has been preserved at every possible moment and the sprawling greenery gives a brilliant backdrop to what is an idyllic location. Accessible only by boat, your privacy is respected and modern facilities are available for every holidaymaker. A chilled out holiday of a lifetime, when are you going? With 50sqm of accommodation space, the Garden Rooms feature a wooden sun deck and direct access to the beautiful resort gardens. The epitome of relaxation, guests may lounge in the sun or relax in the shade of the hotel’s palm trees while drinking in the beauty of their surroundings. With semi open-air bathrooms and spectacular views across the Indian Ocean, the Beach Villas ensure that you are never too far from the shimmering ocean lagoon and surrounding vistas. 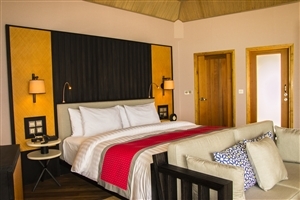 Their beachfront location and 50sqm of accommodation space ensure that guests feel totally relaxed. A private walled area containing a comfortable outdoor Jacuzzi affords guests complete privacy while still enjoying the balmy atmosphere of an evening in the Maldives. 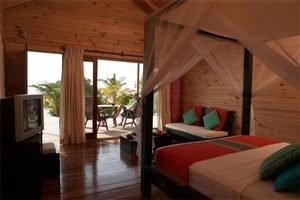 All Jacuzzi Beach Villas include a sumptuous four-poster bed, a wooden sundeck and 80sqm of accommodation space. 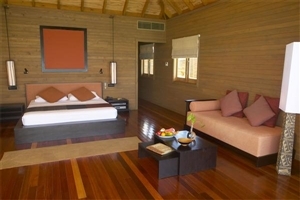 Directly overlooking the nearby lagoon, a walled area allows guests total privacy whilst using their exclusive Jacuzzi. With 60sqm of accommodation space, the Water Villas are positioned directly on the sandy beach, right by the glittering ocean, which may be viewed from the villa’s own private sundeck. Positioned over the glorious lagoon, the Jacuzzi Water Villa offers 85sqm of accommodation space and allows guests to witness breath-taking panoramic views of the Indian Ocean. 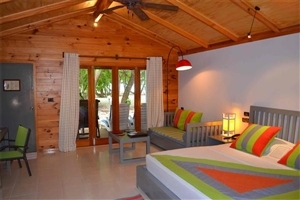 A Jacuzzi-for-two, spacious bedroom, sitting area, DVD player, a complimentary espresso machine and a beautifully decorated bathroom complete this comfortable villa. 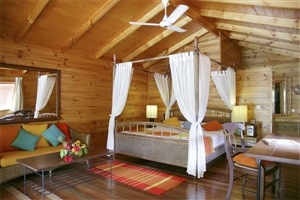 Peaceful, romantic and intimate, the Honeymoon Suite is only accessible by ‘dhoni’ boat. 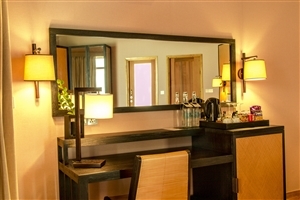 With 90sqm of accommodation space, the suite features a living/dining room area and fully equipped kitchenette. With the opportunity to watch the Maldives sun setting over your own private lagoon pool from your personal sundeck, The Meeru Island Resort is the place to go to ensure that your honeymoon is completely unforgettable. 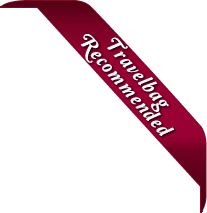 A range of options are available to you as you make the most of this all-inclusive resort. 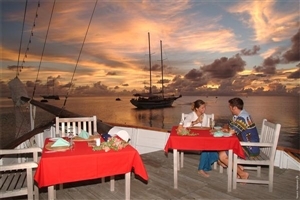 Fairvalhu – Found in the centre of the island, this is where you can get the buffet breakfast, lunch and dinner. Specifically for the guests in the garden rooms, beach villas, Jacuzzi beach villas and Jacuzzi water villas this is a spacious, open-air setting with a thatched roof above the sand floor. Maalan – The north end equivalent of the buffet option. It has the same menu, has the same design and is a spacious area. Asian Wok – An over-the-water eatery at the southern tip, this is a reservation recommended restaurant serving delicious teppanyaki and Asian cuisine. 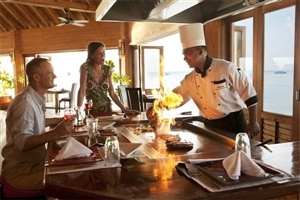 Hot Rock – Using the trend of volcanic ‘hot rocks’, the restaurant and bar gives you the chance to cook your own chicken, game, steak or seafood. Meeru Café – Small snacks like sandwiches, pastries and ice cream can be found here as well as teas and coffees. Dhoni Bar – An al fresco deck that rolls onto the beach, this bar offers a vibrant atmosphere and is also home to the poolside snack house of Hunhaanu. Kakuni Bar – Watch your favourite sports on the big screen with a beer and magnificent ocean vista at this traditional bar. 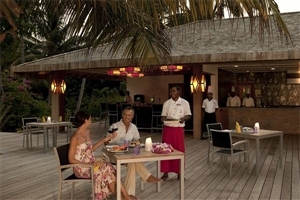 The Uthuru Bar – Part of the adult-only part of the resort, it boasts great views of the sunset. 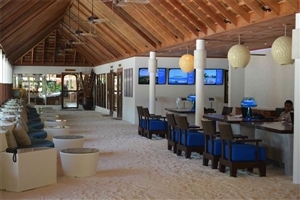 Pavilion Bar – A lively beach bar with seating inside and outside. 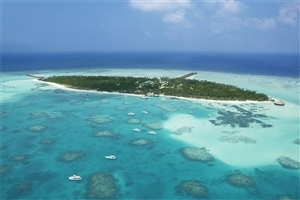 A secluded island is the perfect place to relax but the facilities on offer at the Meeru Island Resort may just get you off that sun lounger to do some activities and recreations. 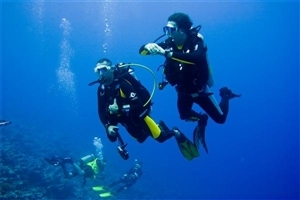 Scuba diving – Explore the coral with the OCEAN-PRO Dive Team. 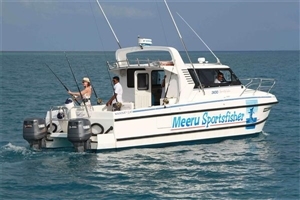 Excursions – From seaplane trips to submarine sightseeing to game fishing, all the jaunts are led by professionals and give you the chance to see more of the Maldives.